ROCKAWAY, NJ - ENDOT's new corrugated slit duct is made of low-density polyethylene plastic for greater flexibility when joining and racking innerducts. Easy to use, it slides readily over fiber optic cable and inside ENDOCOR innerduct. The ENDOT slit duct is offered in 250-foot lengths that can be cut for application in the field. It is available in high-visibility orange in sizes from 1/2" ID through 2" ID. 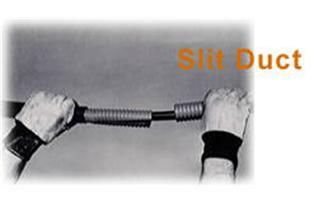 For further information about the ENDOT slit duct and other ENDOT products, feel free to contact us.